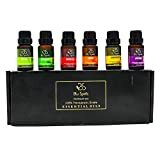 Pack of 6 essential oils - BluSpirits pack of essential oils includes Lavender, Tea Tree, Peppermint, Eucalyptus, Orange, and, Lemongrass (10ml each), with each essential oil having its own unique uses and properties. High-grade essential oils - All oils are 100% pure, natural, and undiluted, and no fillers, additives, bases or carriers, have been added. So, you can be sure of the purity of these essential oils. 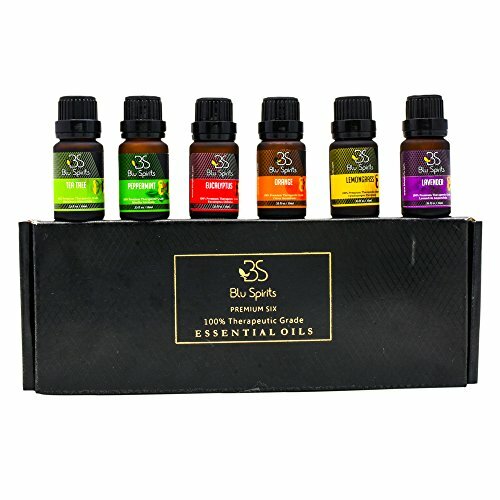 Complete well-being collection - BluSpirits essential oil pack contains the 6 most popular essential oils. These oils are popular for their properties and are well-known for their wonderful effects, backed by evidence. The set gives a complimentary booklet which contains recipes to mix the oils to make blends for various purposes. For the perfect spa-experience - These 100% natural and travel-friendly pack of essential oils offer you the perfect spa experience at home or on-the-go. Plus, you get a booklet with the purchase to give you complete information about the excellent health benefits of these essential oils. Great for gifting - This exquisite essential oils pack is the perfect gift for you or for a loved one. Treat yourself to great moments of peace and mindfulness with these amazing essential oils.